Over the last few weeks, I've invited guest-posters to share their Uncomfortable Truths with you. First Ricky, then Steph, and then Rachel. They were all great, and I have at least three more pinch-hitters to go. But in the meantime, I thought I'd pop back in this week with another set of my own. Because if I go too long without posting a list of five, they start to back up in my mind -- and we can't have that. Tune in next week for the next exciting guest, who will be baring her soul for you. That is, if you can ever bring yourself to come back here after today. 1. When I entered the restroom at work recently, it stunk horribly of poop. For better or worse, the offender had already departed. As I was washing my hands, another woman came in. I left the restroom, then doubled back in and said to her stall door, "I'm sorry. I just can't go back to my desk letting you think I did this. I DIDN'T DO THIS." Pride. It's a terrible thing. 2. I wiped out Nick and Jake's sink the morning on which I took this picture. They brushed their teeth, and then I took this picture. 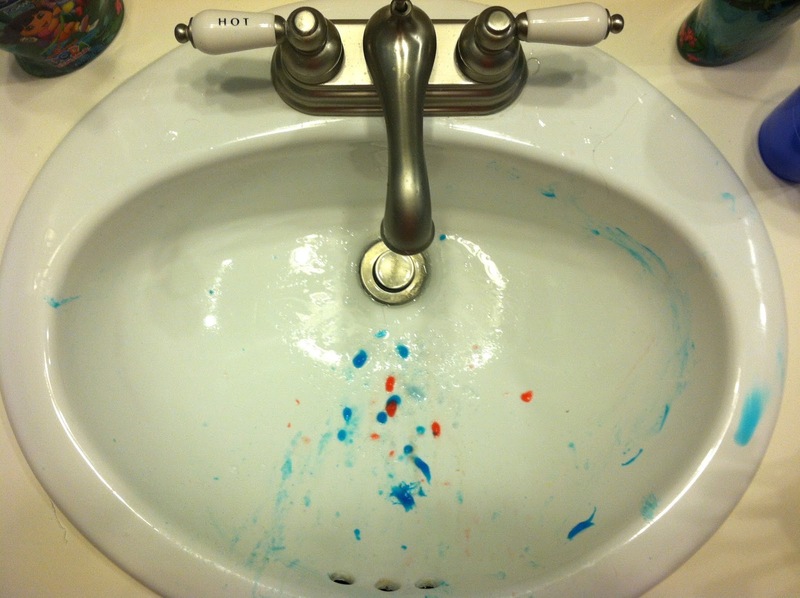 This doesn't even count Nathaniel's mess ... he has his own sink. 3. Someone used the phrase "in my carefree 20s" the other day. Carefree 20s? What are those? I don't think I was ever carefree in my entire life. Do all firstborns feel that way? I remember worrying excessively in like 2nd grade. Got married at 22. Yep, bypassed carefree altogether. To those of you who never come back, it was nice knowing you.